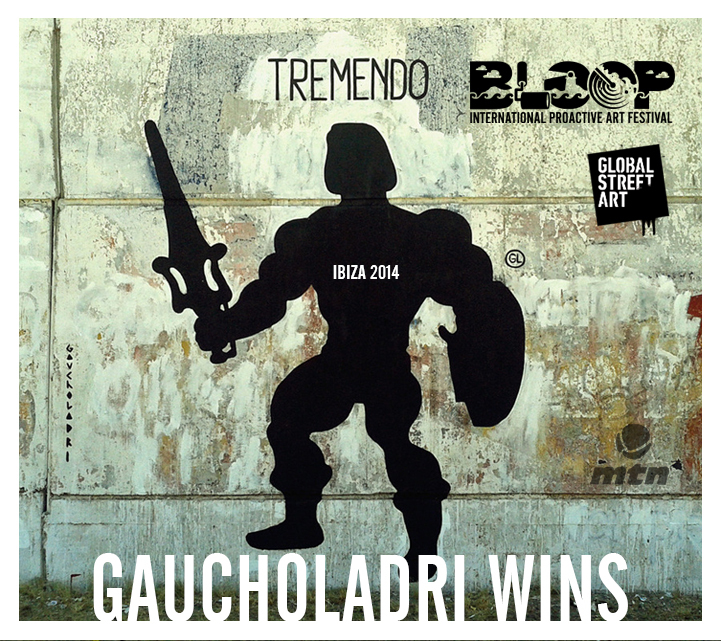 The winner for BLOOP x Global Street Art Contest 2014 is GauchoLadri! We`ve been watching over the contest very carefully from the beginning. During the voting period, 3 out of 5 artists who were shortlisted for the BLOOP x Global Street Art Contest were really fighting their way! We were amazed to see all this movement. In the last few days the 3 were literally head to head towards victory. The results at midnight were Bisser 690, Pekolejo 987, GauchoLadri 1128 (sum of BLOOP fb and GSA profile page). BLOOP and Global Street Art were honored to see this enthusiasm and effort they`ve spent to participate in BLOOP Festival. So we`ve decided to thank them by having their say. All three of them deserve it. The winner of the contest is GauchoLadri, but BLOOP and Global Street Art believe that all the hard work and effort should be rewarded by giving Pekolejo and Bisser a space in the festival!! !